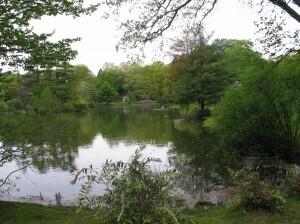 You see this lake in the middle of the Forest Hills Cemetery, designed in the English picturesque view. You may think of a cemetery as a sad place, and therefore you visit seldom. That was not the case in the early 19th century when there was a movement to make cemeteries park-like, where people would come and enjoy the fresh air on Sunday afternoon. In 1840 Boston wanted a park-like cemetery like Mount Auburn in Cambridge. The city built Forest Hills Cemetery in Jamaica Plain, part of Boston. Long before Frederick Law Olmsted designed Central Park or Boston’s Emerald Necklace, the rural cemetery movement took off, modeled after the English park. The rural cemetery meant a burial site that was designed as a park, with curved walkways, statuesque trees, rolling hills of grass, and sometimes a lake or pond. It was to give the urban dweller a place outside the city to stroll on Sunday afternoon. Several years later, in 1848, the Forest Hills Cemetery in Boston was built. Its two hundred fifty acres still stand as a grand example of the rural cemetery. Since a rural cemetery had to be located outside a city, Forest Hills was built in Roxbury, an area then outside of Boston. When Roxbury became part of Boston in 1868, the cemetery changed from a municipal burial ground to a private cemetery. Cecily Miller, Director of the Forest Hills Educational Trust, says, “As the cities became more populated and commercial, there emerged a need for people to connect with nature.” The rural cemetery encouraged visitors to stroll the grounds and enjoy the fresh air. Henry A. S. Dearborn, the designer of the Forest Hills Cemetery, had also been the President of the Massachusetts Horticultural Society. He therefore knew about trees and shrubs, both native and exotic, and English landscape design. He shared an emerging interest in ornamental horticulture, using plants to decorate a property, as a form of art. The grounds at Forest Hills appear terraced with various levels, some of which show off the beautiful Roxbury ledge. Roads and pathways weave through the property. Because of the grading of the cemetery, a visitor may wander down a path, not sure what will appear next, and come upon a group of trees. That surprise is part of the picturesque view, which the rural cemetery illustrated. It was designed so that a visitor would enjoy a bit of nature.